My title made you sing Katy Perry’s new song, didn’t it? LOL! Since I’ve already used up a lot of tiger references in my previous blog posts, Katy Perry’s new single came in handy. ROOOOOARRR! The tiger on my shirt, however, doesn’t seem to be in the mood to do any roaring. I hope you’re not tired of my casual outfits yet. It’s just that whenever I need to wear something comfortable, these shirts and shorts come to mind first. They’re just so easy. The need for comfort came about because I had a shoot on this day, which explains why I’m so made up despite being dressed down. I guess you can say this is my favorite type of model off-duty look. P.S. 1 day left before I choose the winner of my Rebecca & Penelope designer pearls giveaway! Join here if you haven’t still! San outlet ng Celine available ung bag? I tried malls in QC kaso wala. what do you think may nega comments ba or what do you think???? but camille do you think this clothes that i showed you is okay naman maganda ba what do you think? Hi Ms Camille! You look pretty (as always) Hope you don’t mind, where was this photo taken? I would love to take a picture there! :) thanks!! the back drop for these photos seems so fun! love your comfy look.. you make it so easy ms camille!!! Haha! Thanks Zhels! :) Gamsahabnida! Hi ms.camille :) i hope you don’t mind me asking this but you live in manila,right?how come you became friends with ms.kryz?ms.kryz is from cebu..
ohh i see.. :) what course did you get? LOL! Tyra is proud! :) Thanks Yanshi! Lovely outfit. I actually didn’t think of K. Perry when I saw your shirt. It was more like ‘D’aaaaw!- look at that tiger!’ Hah. Hi ate camille! haha. your hair looks soooo nice and bagay. and your over-all outfit? Georgeous! hahaha! sosyal tingnan mga casual outfits mo :D you’re the one who fixed your hair dito? To tell you the truth, Katy Perry crossed my mind but it’s because you got that something reminding me of her. Anyhow, I like your outfit, maybe I’d wear different shoes, but besides that, like it very much. Really? That’s a first! Thank you booklover! You’re one of my blogger inspirations and because of that, I created my own blog hihi ♥ karenjoycekondo.blogspot.com please check if it’s okay. Loveyou Ate Camille! No way am I tired of your casual outfits, Miss Camille! This one is particularly great! I got a kick out of your Katy Perry reference, and I enjoyed going through the photos of this post. It’s a surprise to see you in muted pastels. I admire how you put together this printed top and light blue shorts. The fabric of both pieces look very snuggly. This is comfort mixed with fashion at its finest! I love your choice of accessories! The cap is your leather piece of edge. I like how it puts the look together because of its black and white matte tones. Your spear necklace is a metallic way of supporting ethnic designs, and your personal name necklace is the complement to the muted pastels of your ensemble. The Celine bag is so functional, and I find it to be a classic; what with it’s very androgynous build, to its colors, and its options of carrying by the handles or by the long strap. Your shoes are my favorite piece here! The woven pattern looks awesome against the matte black. It really adds a dash of Filipino identity to this popular shoe type. You wear it free and proud, Miss Camille! I find it to be such a classic as well! My favortie! :) Thank you Angelic! :) I agree with everything you said! You can write my blog posts better than me LOL! i always like your style! We won’t get tired of your outfit,kahit ano pa man yang suot mo.. Kahit banana leaves,haha.. Pag ako nagsuot nyan,parang matutulog lang eh.. hehe.. Iba talaga ang charm mo Camille! Oh, even dressed so casual, a cap on your head, you still look like an elegant angel ! The background actually reminds me of one of the scenes in Luigi D’Avola’s music video for “Back To You” which you were in! Can I just say how adorable you look in there, Ms. Camille? <3 Yayyy! A new hairstyle? soooooo beautiful! Love this casual look, Ms Camille! And no, we’re not tired of your casual outfits! I super love casual look! Always so stylish and chic! Reading your post always inspire me to dress up more! 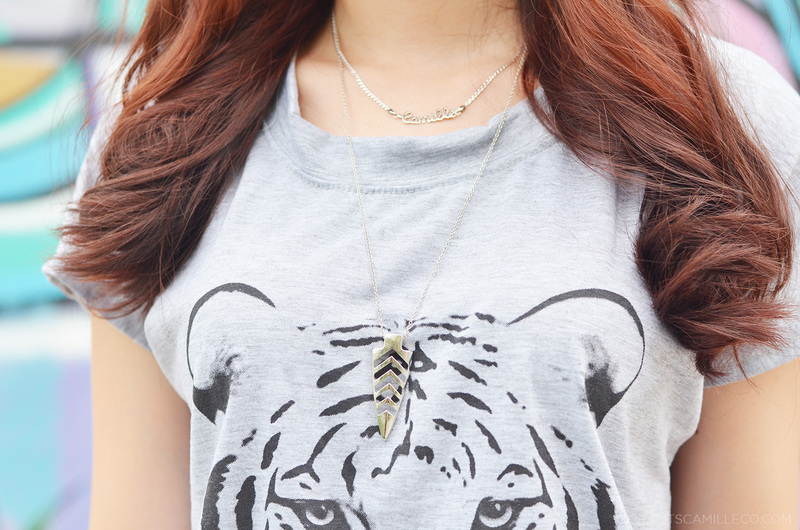 <3 And i have to agree that the tiger on your tee are not in the mood to roar at all.. he looks kinda moody.. LOL! Love this outfit! The tee is so much fun & the bag is beyond gorgeous! I love that song. I think that’s also the music on your BTS on Tomato. Anyhoo, this is the place where Back To You is taken, right? Thanks Anne! :) Me too! If only I have a hairstylist with me everyday! :) Thanks Nikka! Thanks Maebs! :) I love her as well! This outfit screams comfortable chic. The tiger just wants to stare for now. Yes it does! Thanks Naaj! Thanks Lydia! Such a catchy song! How tall are you CC? haha! True! Mukhang galit si Tiger mo! Love those shorts! The kind of shorts na kahit bumukaka ka ng all the way to the point na mapupunit na ang singit…wala paring makikita/maboboso sayo. haha! tyaka anti-ihip ng hangin sa behind yung shorts mo eh! Bet ko yan. mahirap na kasi pag the wind suddenly blows your behind… baka biglang bumaho. haha! Hahahahaha! You’re so funny!!! :) Pero yes, these shorts are the best! Thank you Charisse! I love Celine bags! hi cams! i like your shoes!!!!! and you looked amazing as usual!! by the way, where is this picture taken? the art in your background is just so cool!.